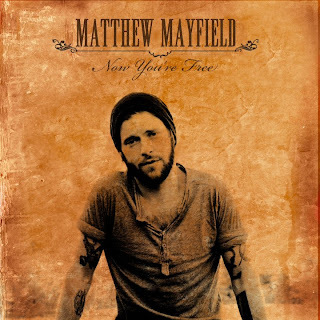 Matthew Mayfield's New Album, "Now You're Free"
After almost a year and a half of putting out six separate Ep's, Matthew Mayfield will be releasing his first full-length album, Now You're Free on April 5th. With this album being the culmination of his previous works, Mayfield has carefully chosen some of his best songs over the past couple of years and paired them beautifully with newly written pieces. Now You're Free aims to provide new listeners with a perfect introduction to Mayfield's works, while still providing his die hard fans with several brand new songs and fresh recordings of some of their favorites. Mayfield has the uncanny ability of crafting songs that start off small, then quickly build into huge anthems. 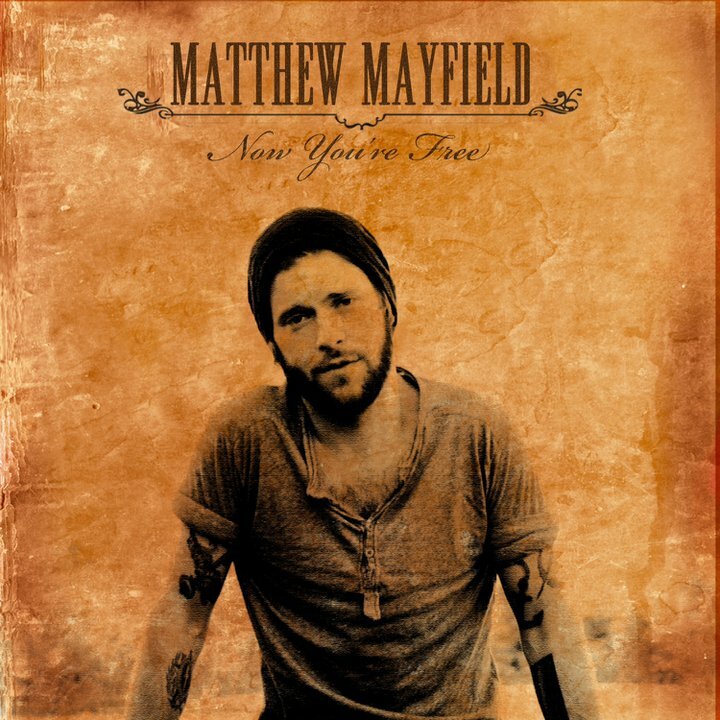 For example, the album's opening track "Come Back Home" begins with a strong beat, southern-tinged guitars and Mayfield's signature raw, yet soulful vocals in a low key. As the song progresses, you can feel the song building as gang vocals are added along with Mayfield's roaring vocals, leaving the listener with no choice but to sing along. Several fan favorites have been re-masked with an even bigger sound, such as "Man-made Machines," "Fire Escape (featuring John Paul White of the Civil Wars)" and "Can't Change My Mind." Along with these is the very popular "Element," which was originally released on the 2007 Moses Mayfield record, The Inside. A stripped down version of the song was then featured on Mayfield's solo debut, The Fire EP, but still had not gained the recognition it deserves. How are you guys feeling about your first headlining tour? 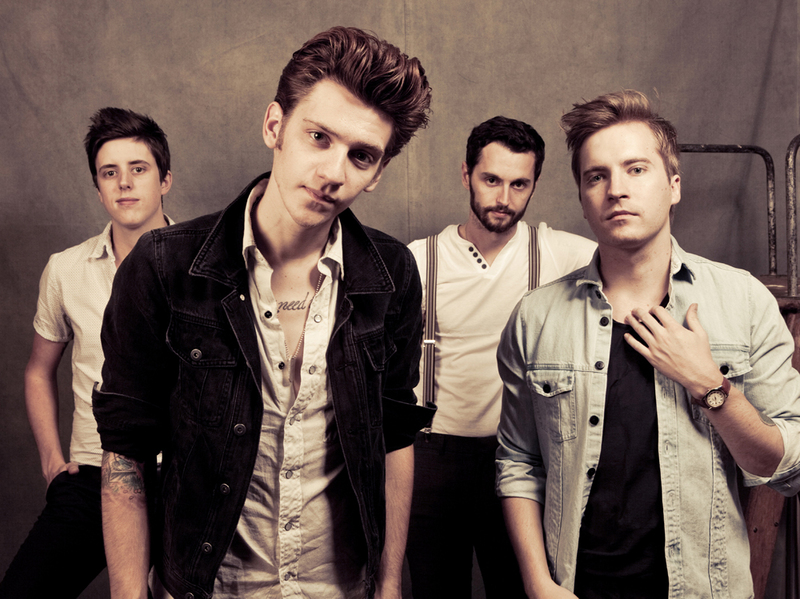 Nick: We are so excited to head out on this tour. We've been a band for few years now, and have been on some of the biggest tours over the last few years. But being able to go out and headline a full US tour for over a month is going to feel pretty rewarding! You guys put out "The Rainy Day Sessions" recently, what would you say inspired the bluegrass feel for this Ep? Andrew: Our mutual love for folk and country was a big inspiration. Most of us grew up on country, and we all like a lot of "folkier" artists like Ray Lamontagne, Bon Iver, Seu Jorge, Good Old War, etc. We wanted to try our hand at redoing our songs with that feel because we all firmly believe a great song can still be a great song when translated into a new style (hence why we tried the Beyonce cover). Nick: We are all country/folk/bluegrass fans. I will honestly say that Country is my favorite genre of music. It is so easy to get wrapped up in the story telling. The instrumentation of a country song is amazing. Between slide guitar, violin, mandolin or whatever it may be, they pull it off in such a tasteful way. When we went into the studio to do The Rainy Day Sessions, we knew exactly what we wanted and we ended up leaving with an EP that exceeded our expectations. Any specific artists that you were playing during the recording process that may have had an influence on the sound? Nick: A lot of Ryan Adams, Johnny Cash, Brad Paisley and Hank Williams. What attracted you to Dan Hannon to help out with this record? Nick: We did a Christmas song with Dan Hannon on a day off during a tour and we had this instant connection. He is truly great at what he does and made us all feel very comfortable. Andrew: We are all HUGE Manhester Orchestra fans. That was all it took. How was the recording process for these songs? Chill? Andrew: Very much so. It was "vibe oriented." Dan Hannon is masterful when it comes to building a warm, creative, comfortable environment for recording and creating. Everyone was very relaxed, inspired, and well, "in the zone." What song surprised you the most in how it turned out? Nick: I'd say Mr. Right. To be completely honest, Mr. Right isn’t my favorite song from our full length, "On Your Side". I'm personally a bigger fan of the acoustic based rock songs we have on there like, "Baby Blue Eyes" and "On Your Side". So, when we brought Mr. Right to The Rainy Day Sessions, we all knew we wanted to do something different with it to make it stand out. We put a folky swing on it and dropped the tempo quite a bit. I think between that and the female vocals, it definitely made me look at the song in a different light. As artists, how important do you think it is to absorbs varieties of different types of music? Andrew: Extremely important. If you wanted to direct films, and only watched horror movies, but then wanted to direct a comedy, you'd have no idea what to do, what to strive for, or how to know what you're doing is total rubbish. Being well-rounded and open minded is one of the best traits one can have as a musician. Are there any specific country songs/artists that you are really into right now? Andrew: Zac Brown and Band Perry have dominated a lot of listening time in the van. For me personally, Alabama takes the cake as my favorite country band ever. I can listen to "In a Hurry" every day and not get sick of it. My other favorite country song is "Forever and Ever, Amen." Timeless! Andrew:Thank you! We all thought it was arguably the best pop song we had heard in years, and we wanted to prove our theory that a well-written song can translate into almost any format and maintain its power and like-ability. How does it feel to be a part of television history? Being a part of some great moments on “Jersey Shore," along with other shows? Nick: (Laughs) I'm personally a big fan of Jersey Shore so it was pretty cool to hear our song during Vinny's breakup scene. Any time you hear your song on TV it's a whole new experience as a musician. It's a crazy feeling for sure. How did you guys get hooked up with helping the non-profit company Kaboom! and how was the experience? Andrew: Through our label. It was an awesome time. I didn't see the episode of "Parks & Rec" that featured Kaboom until last week. I definitely had a good laugh though, and I'm glad Entertainment Weekly pointed out in their cover story on the show that Kaboom is a real charity, because I don't think that was very clear on the show. I'd love to do some more work with them again! What kind of advice do you have for aspiring musicians/bands? Nick: Just keep at it. That's the best advice anyone could give you. If you give up and think you're no good then you're not gonna get anywhere. If you have confidence and keep doing what you love, then you will go far. What is next for you guys after the tour? Any writing or recording in the future? Andrew: Both in fact! Writing, recording, then more touring! Right now I am really hooked on this Rise Records artist, Decoder. After a little bit of reading, I found out that the group is practically a supergroup with drummer Brent Guistwite, formerly of Of Machines, guitarist Jack Burns, formerly of Oceana, Keith Jones, formerly of Oceana, Spencer Pearson, formerly of VersaEmerge, bassist Bryce Sipes and guitarist, Anthony Sepe, formerly of Chasing Thrill. I have been completely blown away by Decoder's unique sound, especially the perfect combination of Pearson's haunting vocals, Jones' perfect screams, and Burns' floating guitar riffs. You must check these guys out! Can you give a short summary of how the band came together, and the idea for the project came together? Shortly after me and oceana ended ties it was around the same time as label mates of machines were coming to an end so I ask their drummer at the time Brent to jam and see if we could get something going. Shortly after we found keith (my original frontman, and spencer from versaemerge to do vocals ) then bryce and anthony came later on down the road. Can you explain the process on how you guys arrived on your sound as a band, being guys that all can from fairly different bands/backgrounds? I had a bunch of songs written and after jamming them and demoing them with our friend Drew Fulk we all had a pretty good idea of what parts of our band we wanted to emphasize on. And aside from that we were trying to not sound any thing like our previous bands. How did you guys arrive on Rise Records? What attracted you guys to them? Rise is simply the best. More then half the band has been signed by rise in the past and it is a great label to be on and they really believe in what we do. Rough for sure. We had several songs written before we were set to record but most of which we were all unsure of. So we pretty much had a month to buckle down and write 8/9 songs for the record. and then we had a good deal of time in the studio which helped us work out the kinks. How has the reaction of the album been so far? Amazing, everything i've hoped for and more. The best thing ive heard is that it has touched people the way we intended it to. What did you experience in writing together, that you hadn't experienced before in previous projects? A vibe and flow like no other. We all can branch off each other so well and we always somehow maintain a positive working energy. How was the overall recording process, how did it differ from previous experiences? It was amazing, we were rushed but in a productive manner.We were pressured to do good and i feel the pressure helped. Brent killed it on drums which allowed a good time to sit and experiment with the guitars and still left a ton of time at the end to work on vocals. I would say overall a lot smoother, especially since we were so new as a band. Recently you stated that people who come to you show can expect "a set that will really put a vibe in the room and make you feel a little un-easy, but completely satisfied after." Can you expand on that? Our band is very Erie/drone-y and we play off that live, its very emotional and powerful and I feel the parts almost hit harder and have more of a soulful impact live making you want more and truly feel where we are coming from. Who are some guys that you have looked up to in the past as far as stage presence goes? Tim from underoath, Daniel from norma jean now underoath, Old as cities burn always hit heavy in the heart, Everytime I die. People that go out on the stage and give them self 100% to the music and enjoy it the whole way through. Touring plans after this current tour? In March/April? Short run to The Jamboree in Ohio, then waiting until May for a full us with some close friends of ours. Either, Kid Cudi, The Chariot, or the Chill/Downtempo Pandora station. Well we've been in Nashville going on 2 years now. Crazy! We've recorded two eps and released one of them back in mid December called "Our Monster" ( you can get in on itunes or on bandcamp) We moved here with just one car (15 passenger van) an no jobs. Wanted to feel grown up and be around musicians that inspired us. We've done just that. It's been a lot of hard work but we're finally able to get refocused on our music because life beat us up the first year we were here. Now, we have an ambitious goal of 4 eps in a year. It will be great if we can do that. SO, that's it. Working on redefining The Bridges sound and getting it recorded quickly so we don't become bored or uninspired. Yeah, we're always writing little tunes that hopefully turn into full blown songs for the next time we record. Are you heading in a new direction with your music? How are you seeing it change? Yeah, I do think we're heading in a new direction. We've all starting writing more which, naturally, makes the sound different. For example, first record was collaborative but Brittany did most all the lyrics. Now that we're all doing melodies and lyrics it has changed to a more eclectic sounds. You definitely hear more folk in us and we also have a bit more "adventurous" pop songs. Not as predictable you know? It's for sure more mature and well rounded because we're writing about things we hadn't experienced on "Limits of the Sky". We've evolved as people now and if were writing honest music (which we are) then the evolution should translate. How does the writing process normally pan out for ya'll? Writing has been difficult due to job interference and all of us just juggling growing up, relationships and life really. I find we have tons of songs and and material to build with BUT it comes down to taking time off and getting into the studio. You really see it unfold and it comes so easily when you get in there. Who are some musicians/bands that you are currently listening to, that you feel like may have an influence on your sound? We're still listening to a lot of old 60's and 70's folk. We've been really into Harry Nilsson, John Prine, Emmy Lou Harris, The Byrds. Then some newer bands like, everyone loves Arcade Fire, Mumford and Sons, Dawes, Rihanna does awesome stuff too (totally different vein,we know) and bands like that. Anybody that's doing something new and writing good songs are susceptible Also, really killer band called Middle Brother -Deer Tick, Dawes, Delta Spirit super group of sorts. Their record is incredible. Are you working on any touring coming up soon? No, I'm sure we'll play some one offs here and there. If there was a good tour offer with a band we loved we'd take it for sure! We love love playing live but find it more beneficial to write and record. We'll have to pay for that and in turn, means working our asses off and that takes a lot of the time up that we'd love to spend on the road but it's just not feasible at the moment. How would you describe your live performance to someone who hasn't seen you in concert before? There is definitely a chemistry live you'll never hear on record because it's not heard. It's seeing the chemistry of people so close that know each other's every move. It's entertaining for me to watch my band mates and best friends do what they love. That feeling transcends somewhere into the mix of the performance and the crowds reception. It makes the music better and enhances the vibe for everyone (crowd and band) when you have that history and genuine love for what you're all doing together it certainly makes for a different feel from anything recorded. Who are some of bands/musicians that you have looked up to in the past in regards to live performance and stage presence. The Beatles (duh) Fleetwood Mac, Led Zeppelin, The Band we're really into light shows so like, Pink Floyd and Muse are always good. Edward Sharpe and the Magnetic Zeros have a really nonchalant show and that's really refreshing. To see people not look stressed or worried and allow the music to be fun and fluid makes me smile. 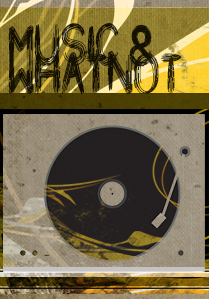 Where is the best place to find out more information on the band (news, release dates. touring schedule, etc.)? Best places are twitter for like day to day check-ins but also wearethebridges.com is the band site. DON'T go to myspace. Ha, it's totally uncool. Or go, it will be funny.